As part of the adaptive immune system, antibody-dependent cell-mediated cytotoxicity (ADCC) is a critical mechanism of the immune system’s defense. Typically, the invading pathogen or a cancer cell is identified by a specific therapeutic antibody and is subsequently killed by immune cells that recognize and bind to the therapeutic antibody. Traditionally, cytotoxicity assays such as ADCC have been performed using various release assays described below. By labeling the target tumor cells with non-toxic, non-radioactive calcein AM, we can monitor the killing of the tumor cells by the immune effector cells by performing a calcein AM release assay. Celigo image cytometer acquires whole-well images and reports the number of live calcein positive cells. By imaging the same plate over a period of time, or by plating different E:T ratios we can examine the dynamic killing process of target tumor cells visually and quantitatively. As time increased, the number of calcein AM stained target cells decreased. In the control antibody, the neutrophil did not induce cytotoxicity. 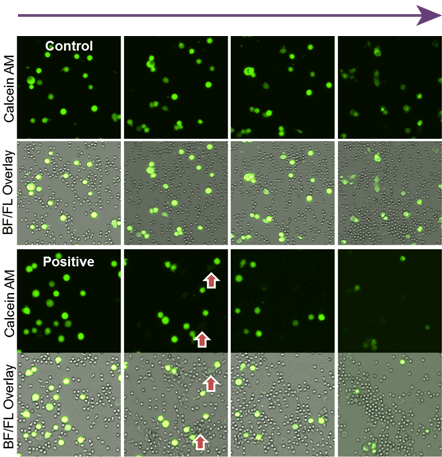 It is clear in the bright-field/fluorescence overlay images that the neutrophils surround the target cells and induced cytotoxicity. 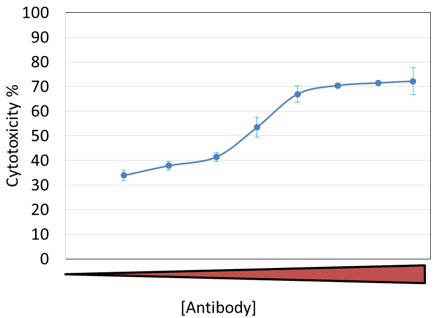 In the time-dependent graph, different antibody concentration showed a different level of cytotoxicity % over time. In the dose-dependent graph, the dose-response also showed a different level of cytotoxicity % as antibody concentration increased. Visually, the number of dead target cells (Yellow), decreased as the antibody concentration decreased. At the endpoint, a clear cytotoxicity dose response is shown with respect to antibody concentration. The cytotoxicity % is calculated by the equation below. As the antibody concentration increased, the cytotoxicity % also increased.